1. 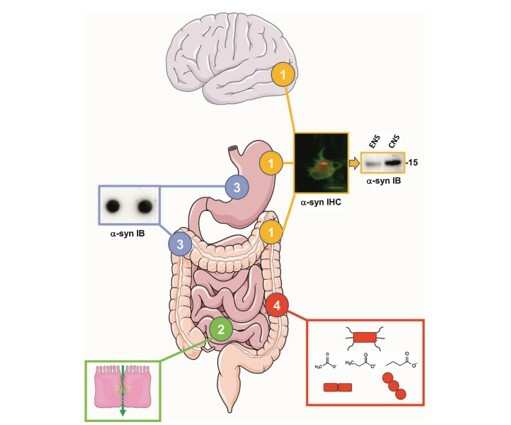 Alpha-synuclein deposits are observed in the enteric nervous system (ENS) of PD patients However, it remains to be determined if the alpha-synuclein aggregates in the ENS are biochemically similar to the ones found in the brain as this might be critical in understanding the role of the gut in PD pathogenesis. “Our understanding and appreciation of the importance of the gut-brain connection in PD has grown rapidly in recent years. We are confident that the coming two decades of microbiome-gut–brain-axis research will see an even accelerated development in this area that will reshape our understanding of the pathogenesis of PD,” concluded Dr. Scheperjans. Full open access study: “The Gut and Parkinson’s Disease: Hype or Hope?” by Filip Scheperjans, Pascal Derkinderen, and Per Borghammer (DOI: 10.3233/JPD-181477) published in the Journal of Parkinson’s Disease, Volume 8, Supplement 1 by IOS Press. It is openly available at content.iospress.com/articles/journal-of-parkinsons-disease/jpd181477.